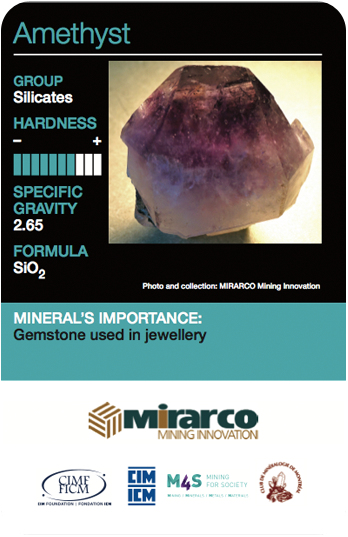 The distribution of this card is courtesy of MIRARCO – Mining Innovation in Sudbury, Ontario, Canada. MIRARCO, as its acronym states, is a Mining Innovation, Rehabilitation and Applied Research Corporation that delivers quality research and innovative solutions to the global mining industry. Since its establishment in 1998, the unique, not-for-profit entity has engaged itself to six core research domains: Mining Safety Research (MSR), Geohazard Assessment and Risk Mitigation (GRC), Ventilation and Production Optimization, Environmental Monitoring and Rehabilitation (EMR), Energy, Renewables and Carbon Management (ERCM) as well as Climate Adaptation and Sustainable Communities (CASC). This corporation, comprised of teams of scientists, engineers, IT and business professionals and students, is situated in the Willet Green Miller Centre on the campus of MIRARCO’s shareholder, Laurentian University in Sudbury, Ontario, Canada. MIRARCO – Mining Innovation strives to have many international partnerships with mining schools and research facilities around the world. As a strong influence in the global mining community, MIRARCO can provide the design and implementation of safety modules for engineering schools in Canada, regulatory advice in Occupational Health and Safety, technical expertise in Mining Ventilation, Virtual Reality Lab Simulations, the design of health and safety programs for supervisors, inspectors, and managers as well as technical advice regarding Mine Rescue Emergency Procedures. In brief, MIRARCO’s vision is to develop the people and innovative tools needed to plan and design the mines and mine waste facilities of the future that conserve environmental integrity and preserve sustainable communities. For additional information about one of Canada’s fastest growing universities, please visit Laurentian University’s website at www.laurentian.ca.